The liquid fluidity of the sludge is high, it is necessary to use sludge dewatering machine to reduce the sludge amount. The liquid sludge can be dewatered and conformed to a dry form after thickening. 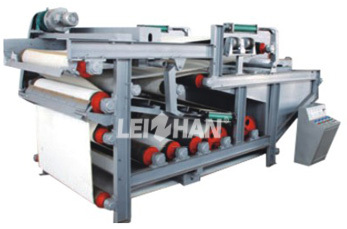 Leizhan developed HD series sludge dewatering machine by absorbing experience and advanced technology over the years. Leizhan HD series sludge dewatering is used for concentrate sludge in paper making industry, muicipal engineering, etc. Wedge dehydration, a specially designed dewatering roll.